Bees are our friends, despite the occasional painful bee sting and medical concern of allergies to bee stings. Bees pollinate the plants that produce our food and, therefore, are required for our survival. 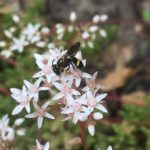 There are many more species than just the honeybee, which is a species introduced to North America – native bees make up the greatest portion of our bee population. We need to understand bees in order to appreciate them and support their survival. 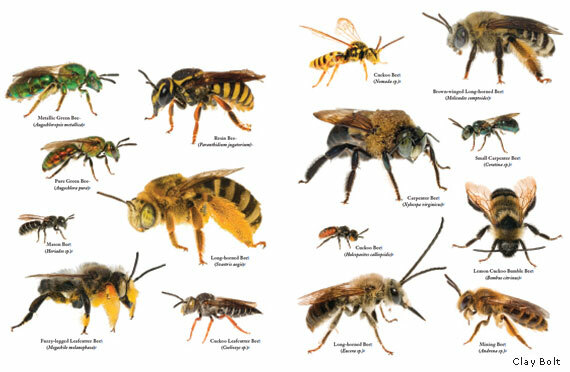 Most of our native bees are not aggressive and many are solitary dwellers – they do not live in colonies like the honeybee. 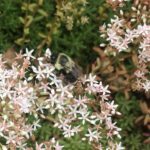 For some in-depth information on specific bee species and their preferred habitats and food sources, read this great bulletin from the University of Maine or this article from the National Wildlife Federation. Remove bee food sources near your living areas. Remove nests from under eaves and from tree branches that are near doorways or sitting areas. Repair or cover holes in any outdoor structures – any unsealed area should be sealed with caulk, wood, or flashing. Inspect sensitive areas monthly during the active bee season to monitor for new nests. 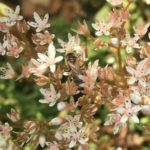 NE native bees on sedum. 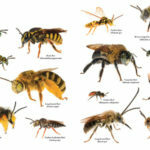 Native Bees Poster – Image from the National Wildlife Federation.